Jihad Watch : Bravo. Long overdue. At last, an administration that doesn’t respect the polite fiction that the UN is a neutral arbiter. Next step should be withdrawal from the UN altogether, and its expulsion from New York City. 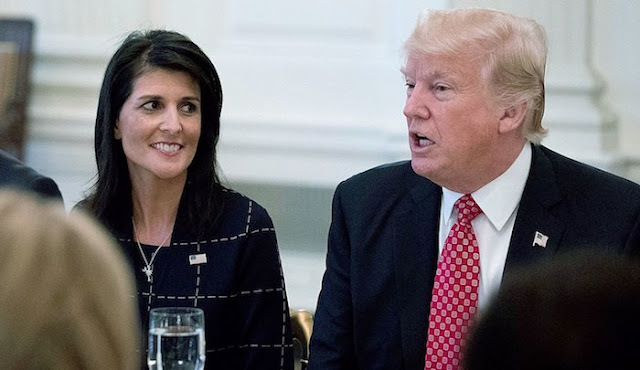 “Trump administration withdrawing from UN Human Rights Council,” by Andrew O’Reilly, Fox News, June 19, 2018: The Trump administration is expected to announce Tuesday that the U.S. will withdraw from the United Nations Human Rights Council. A U.S. official confirmed the decision to Fox News. Secretary of State Mike Pompeo and U.N. Ambassador Nikki Haley will use a joint statement in Washington at 5p.m. to announce and explain the departure from the 47-member council. Speaking to Fox News, a senior official said that the UNHRC protects human rights abusers, allows them to serve on the council and shows bias in rendering decisions. The official claimed that countries like China, Egypt and Russia worked to undermine U.S. reform efforts and that the council has passed more resolutions this year condemning Israel than Iran, Syria and North Korea combined. Trump has long been critical of the UNHRC, which he has accused of showing a bias against Israel. Haley last year slammed the body for its “relentless, pathological campaign” against Israel. Trump’s National Security Adviser John Bolton opposed the creation of the body when he served as the U.S. ambassador to the U.N. under President George W. Bush.